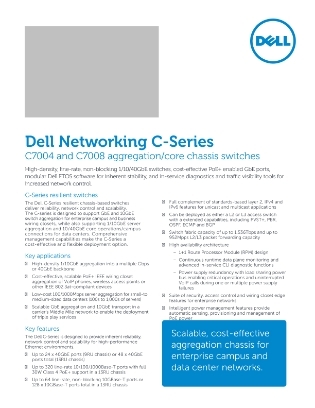 This brief video introduces the Dell C-Series: Resilient, chassis-based switches that deliver reliability, network control, and scalability. The series is designed to support GbE and 10GbE switch aggregation for enterprise campus and business wiring closets, while also supporting 1/10GbE server aggregation and 10/40GbE core operations/campus connections for data centers. Comprehensive management capabilities make the C-Series a cost-effective and flexible deployment option. Watch now to learn more about this scalable, economical aggregation chassis for enterprise campus and data center networks, including information on features, applications, and more.